A matter of honour, settled with sabres, was still somewhat common during the Early Victorian era (1837 to 1861*). In the German States it had evolved into duelling clubs, mostly based at universities, where young men gleefully slashed at each other regularly over any slight, wanting to receive wounds as badges of honour. This was known as academic duelling or mensur. These fights were not meant to be fatal, so thrusts with the weapon weren’t used, and the greatest danger lay with infection. This existed to a small degree in Britain, but generally the wealthy students and gentlemen practised swordplay as exercise, and saved duelling for genuine insults. 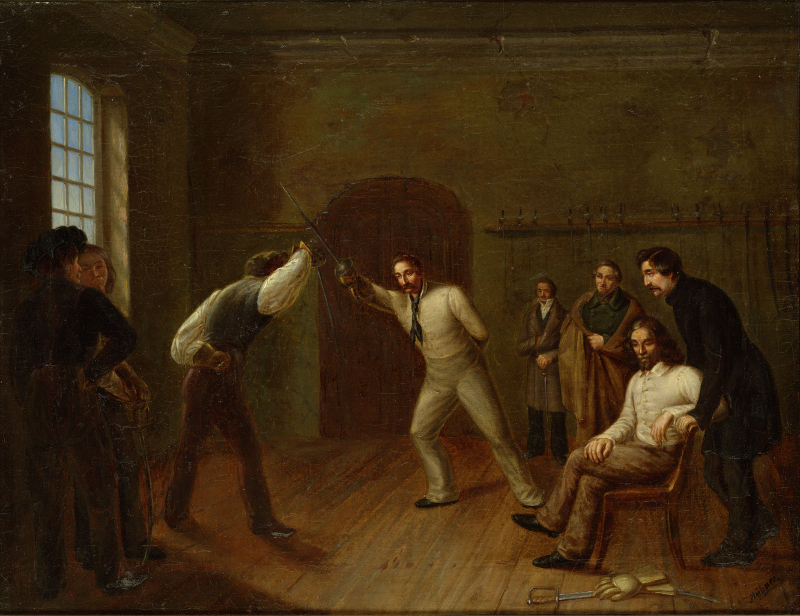 The Fencing Loft, by Carl Wilhelm Huber, 1840, shows men honing their skill. In Britain, relatively few duels were still being fought with swords after the Napoleonic Wars, pistols having been adopted. However, sabres were still selected, particularly when a matter of honour required “first blood” and satisfaction could be reached without a death. This would depend on the degree of insult, or perhaps over a lesser disagreement in politics. The next higher condition was when one party could no longer fight, due to severe wounds or some other physical impediment (pinched nerve, pulled groin, &c.). And finally, to the death, or “a la outrance” in French, in which satisfaction would not be reached until one party was mortally wounded. The surgeon, usually present and with a sober outlook, might step in and halt a duel at his discretion, by imploring to the seconds, and probably saved many duellists. However, depending on the wounds, a doctor who meant well may have only prolonged death, which came agonizingly through infection. 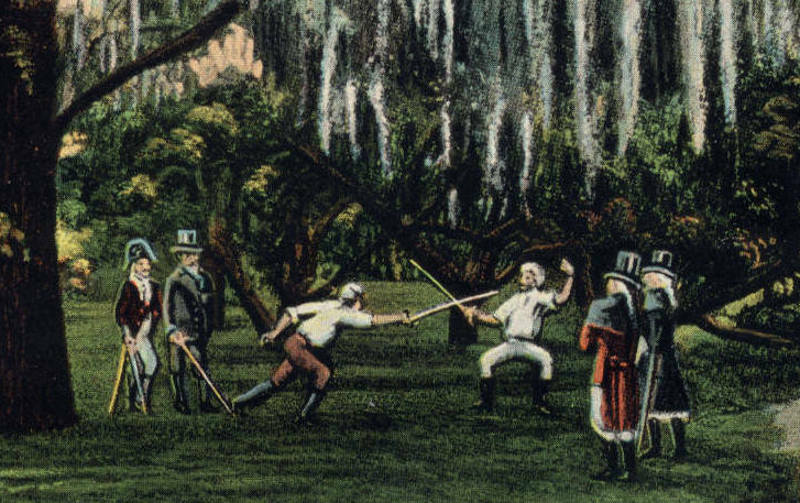 A detail of a postcard depicting a duel fought in 1841. A small but deep wound, which a man may have shrugged off, often proved fatal through loss of blood. A duel might go on for quite a while, and a cut received at the onset slowly took a toll. A wounded individual could ask for mercy, and seek aid from the surgeon, therefore giving up the fight and the other man declared victorious. The sport of fencing became hugely popular as the 1800s wore on. A touché in fencing, as in hitting your opponent and scoring a point, was nothing like the kind of slash or stab of a genuine duel. Those who trained for combat did not necessarily make great fencers. In battle, a weapon must be held firmly and used brutally, while for sport the grip is delicate, the blade used with finesse. The academic duelling was closer to combat, just with very controlled conditions. * The early Victorian era ends in 1861 with the death of Prince Albert and the beginning of the Queen’s lengthy mourning period. Some kind of honourable duelling should still be legal. For men and women. @ Jennifer. You’re my kind of girl. These articles are educational and entertaining. Very nice post. I’ve really enjoyed browsing your blog. I remember that quite a few er….”problems” in the Sharpe films are dealt with by duelling…and the use of “dirty” tactics being high effective but “not done” – which is why Sharpe wins every duel that he fights , except when interrupted. 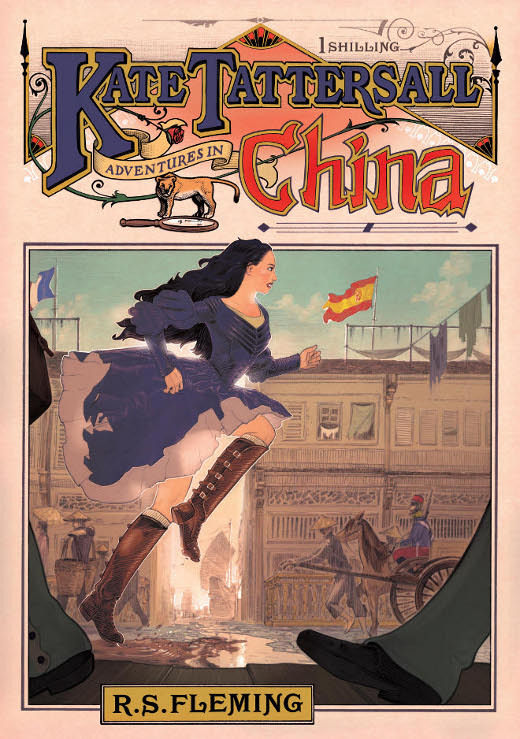 Although the pistol duels are more interesting…especially the one where he shoots his opponent in the buttock! Brilliant info as ever! I practice Victorian saber as part of a historical fencing group I am a part of in West Michigan, and this article is pretty good. Just as today I find it intriguing how during this period there was already a divergence between practice of a sport, the modern fencing, and a martial art which is what I practice and what my Victorian saber master Hutton was acutely aware of.